Become a member | JOIN NOW! We began the Teacher Certification process to develop, maintain, and provide support on a national level to those who teach Guang Ping Yang T’ai Chi Ch’uan, and to help ensure a high level of competency and the quality of instruction in t’ai chi and related traditional Chinese internal martial arts disciplines. We established a Certification Committee to review all applications and recommend to the board approval or denial for a Teaching Certificate. The Guang Ping Yang T'ai Ch'i Association Board of Directors then has the final vote in wich two-thirds (2/3) majority is needed for granting certification. You will find on this page links to all of the information and paperwork needed to apply for a Teaching Certificate as well as our Code of Conduct that describes the professional standards by which Certified Teachers must teach. 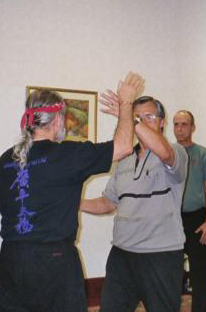 It is a requirement to be a member of the Guang Ping Yang Association in order to become certified to teach.